Veerasammy Permaul tormented the batsmen to bag match figures of 13-145.
spin webs around the batsmen yesterday on a fast deteriorating Providence pitch as the final four-day practice match to select the Guyana Jaguars team for the inaugural West Indies Cricket Board (WICB) Professional Cricket League Regional Four-Day Franchise Tournament which starts on November 14, ended in a tame draw. 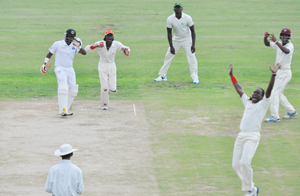 The Jaguars will play the Leewards at the Guyana National Stadium at Providence in their first of three home matches before travelling to Trinidad & Tobago for their final game for the year next month. Set 208 to win from 45 overs after dismissing Singh’s X1 for 150, a run-chase which lacked intensity and an under-prepared pitch which kept increslingly low as the game progressed, combined to produce a stalemate as Johnson’s X1 ended on 74-3 when the game was inexplicably called off with over an to go before the scheduled close. Singh’s X1 resumed the final day on 31-2 and slumped to 123-6 by Lunch as Permaul ripped out Kandasammy Surujpaul (20), Skipper Vishaul Singh (0), Royston Crandon (8) and Chanderpaul Hemraj (29) as wickets tumbled in a heap. The slide was briefly arrested when Hemraj and Steven Jacobs joined forces at 54-5 to take the score to 115-6 with a fighting 61-run stand before Hemraj, who struck three fours and two sixes off Bishoo, departed just before the interval. Narsingh Deonarine survives a confident appeal off Steven Jacobs. and a six off Bishoo and left his team on 125-7 after Lunch. When Johnson’s X1 began their second innings the expected run chase never materialised after Rajendra Chandrika (15) was beaten for pace and had his off stump plucked out at 26-1 by Jeremy Gordon who was the best fast bowler in the two matches, while Raun Johnson, who had Chandrika dropped at point, also bowled fast on the docile pitch making the batsmen work hard to find their range of scoring shots. 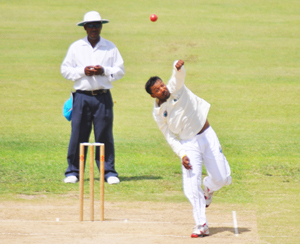 From a position of 361 from 16 overs at Tea, Trevon Griffith and Barbadian Raymond Reifer, who was promoted to number three in the order, got themselves bugged down against left-arm spinner Jacobs’ quick off-spin. Griffith, who top-scored with 37, missed a sweep at Jacobs and was LBW at 70-2. The left-handed Reifer (15) tried to free the shackles with a crunching cover driven boundary off Nanan but was soon trapped LBW to Nanan to one that scuttled through without addition to the score. Skipper Leon Johnson (0*) and Narsingh Deonarine (4*) were at the crease when the game was prematurely halted. Assad Fudadin and Ronsford Beaton are expected to arrive from Sri Lanka tomorrow night and the Guyana Jaguars team is expected to be named by Monday.